A close knit 11-member family of Brownstown, Georgetown, made up of six adults and five children, has been relocated after a fire destroyed their homes on Tuesday around 8 p.m.
Three houses, one owned by Theolynda Adams, another by Adamsâ daughter Bernadette Sutherland and one by Shakila Sutherland, were completely destroyed, along with all of their contents. The houses were all located on the same piece of family land. A fourth house was saved from the fire bug by helpful residents, who kept dousing it with water, despite the searing heat that broke its windows and burned some shingles of the wooden structure. A concrete house nearby lost two windows as a result of the heat. 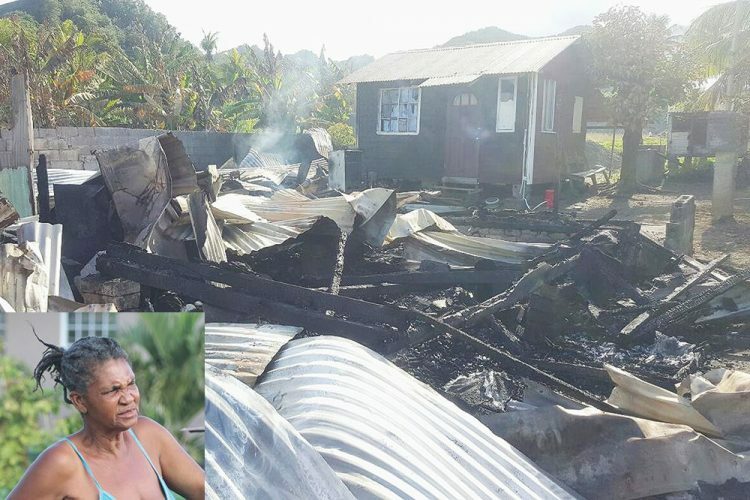 Theolynda, the matriarch of the family, told SEARCHLIGHT on Wednesday that she was at home when she heard a commotion that she later realized was someone telling them that one of the houses was on fire. âFrom the time the fire hit one place and you pitch water the fire go somewhere else,â said Theolynda, who noted that in their haste to flee the heat, they forgot five-year-old Lenny Baynes was asleep in one of the burning houses. Baynes eventually ran out of the burning house and escaped unhurt. He later told his family that he was awakened by Bernadetteâs voice. Telling her part, Bernadette said that she was thankful for life, but stressed that she lost âevery single thing,â including the little money she had, her phone, clothing and a number of other items. She said that they do not know what caused the fire, as they do not use candles and nothing electronic was plugged in where the fire started. Bernadette said that the Georgetown Police and helpful residents fought the blaze in the absence of a fire truck and firemen. Shakila told SEARCHLIGHT that her house was home to her brother Shawn Sutherland, her 11-year-old daughter Terrica Browne and two-year-old son Suarez Brown. Terrica is a grade six pupil at the Georgetown Government School (GSS). She said that she was at a nearby shop when she was told that her house was on fire. âI canât say what started it. I feel really sad, I lost everythingâ¦stove, fridge, mattress. The gas bottle blew up and that stopped us from getting anything,â said Shakila, who revealed that so far, the family has received help from, among others, the Ministry of Social Development and the Red Cross. Also displaced by the fire were Lionel Adams, Kevon Sutherland, Lonny Sutherland (three years old) and Kenisha Sutherland (16 years old).